We all know that Roman legions never reached the Scandinavian peninsula. It is possible that a Roman 'Client State' existed in what is now Danemark (please, if interested read my researchomnia.blogspot.com/2015/08/roman-client-state-in-denmark.html ), but actual southern Sweden was too far to the north to have any minor link to the Roman empire. Of course, explorations were done in the region by the Romans (initially under Augustus) and the Roman merchants traded in all the Baltic sea with the famous "amber commerce". Two rings and one coin found in 2017 confirm a theory that the Öland island was in close contact with the Roman Empire. Close by, were found pieces of Roman glass. The coin was made in honor of Western Roman Emperor Valentinian III (425-455 AD). The emperor is depicted on one side of the coin, with his foot resting on the head of a barbarian – a common motif in coinage from the period. Indeed the Romans set up a network of hardened roads for the amber trade with inns a day’s horse ride apart, inside their empire. Many military strongholds providing safety for travelling merchants were also established (a few also in "Barbaricum" territories, according to recent researches). Travelers included not only merchants but also soldiers and officials. Settlements developed and cities sprang up at the junction of the main marching roads. The itinerary in those centuries ran from Aquileia, one of the Roman Empire’s main trading hubs (located near the northern tip of the Adriatic sea), to what is today Vienna, Brno, Wroclaw and onwards to Sambia in the area of today’s Kaliningrad/Koenisberg region (and Lithuania and Latvia), where the amber deposits were much bigger. Roman merchants also traded with southern Sweden and the Öland island was a trading outpost, according to recent archaeological discoveries. The Romans who travelled north for ‘the gold of the Baltic’ would take with them various items to be traded, including fabrics, ceramics, metal objects, trinkets, wool, as well as bronze and brass artefacts. They brought back sacks of amber, animal skins, wax, feathers and beaver coats. Due to increasing intense economic contacts, Roman coins also were started to be used (nearly one thousand "solidii" -from the fourth and fifth centuries AD- have been found in the southern Scandinavia region, read numismatics.org/digitallibrary/ark:/53695/nnan59692), but actually there it is not a huge research by academics on this matter. However, there are some interesting studies in the last years about the so called "Sweden's Pompeii": Sandby borg in the island of Öland. In this Swedish island archaeologists have discovered many Roman coins with nice jewelry and various objects, like onions (that were not produced in Scandinavia). For example, see the video https://www.youtube.com/watch?v=WMoIWk0rjE8&feature=c4-overview-vl&list=PL7439DE669A0B72B3 or read the interesting article www.atlasobscura.com/articles/swedish-ancient-onion-found, where it is written that: "...Found a 1,500-Year-Old Burnt Onion Linked to ‘Sweden’s Pompeii’...The ancient vegetable affirms a Swedish island’s ties to the Roman Empire.....Nicknamed “Sweden’s Pompeii” by researchers, Sandby Borg was the site of a mysterious fifth-century massacre. In 2013, Sweden’s Kalmar County Museum and Lund University researchers found the slaughtered remains of its inhabitants. They had been ambushed and butchered by unknown attackers in the middle of the night. Some bodies were “lying by the door as if they were running for the door and people were coming in,” said Helene Wilhelmson, one of the archaeologists. 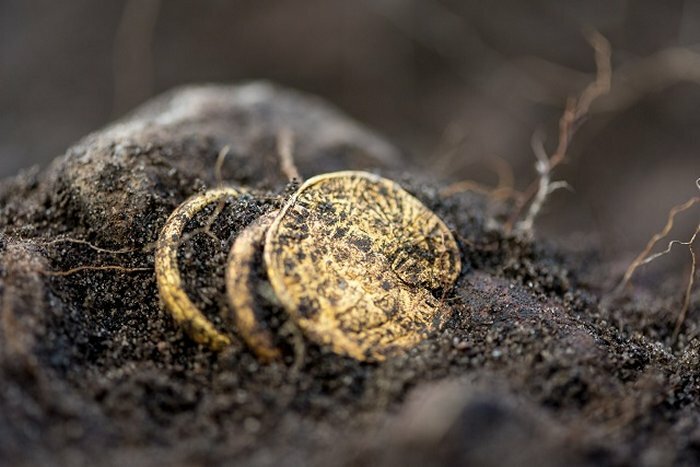 They were not buried, and left in their frozen terrorized state for centuries.It’s possible that the raiders were looking for Roman gold rings and coins found last year at the ring fort. The onion further shows that the people had close links to the Roman Empire...."
The first mention of Swedes in History comes in 98 AD from the Roman Tacitus, who calls them Suiones. Jordanes in the sixth century calls them Suehans and Suetidi (the same people but possibly in two divisions). Indeed the long and narrow island of Öland in the Baltic Sea, close to Sweden's south-eastern coast, in the fourth/fifth century was becoming important as a crossroads for Baltic trade. Commanding it was meaning power and status. Archaeology on the island has shown that the gradual disintegration of the Roman empire has left a large number of former soldiers deposited here. Presumably this was after having followed the trade routes themselves or returning home after having offered themselves for service to Rome, as no Roman outpost had ever been established this far north. These soldiers have probably found that some degree of their experience was required on the island, but they also largely turned their hands to a more pastoral existence. Several massive fortifications known as "borgs" (forts) have been established on the island, with earthen walls and Roman-style gates around 4.5 metres (fifteen feet) that encircle small villages and food stores. These borgs appear to be temporary residences rather than permanent settlements. Around 480 AD one such borg was attacked and defeated, its hundreds of inhabitants brutally executed, some with their mouths stuffed with goat and sheep's teeth. Greeks and Romans both buried warriors with coins in their mouths to pay for their transportation into the afterlife, but Germanic tribes also had a similar practice, suggesting a shared Indo-European origin for the practice. This version, however, seemed to be a parody of that custom. The bodies were left unburied, rotting where they lied. None of the considerable wealth that was left behind was plundered. Leaving behind such valuable plunder, not only at the time of the massacre, but for every generation afterwards until the settlement was overgrown and hidden by nature, suggests something greater than mere political warfare. It suggests dire warnings against trespass across the generations, with parents instructing their children not to go near the cursed site. Usually only plague sites can generate such an impact, although the cause in this borg's case is still unknown. One other theory is that some sort of religious or shamanistic involvement was responsible. Fifth century Romans were mostly Christians, while Scandinavians were all staunchly pagan. If the borg with its large Romanised population has been Christianised and was attempting to 'infect' the rest of the island, the local pagan priests may have been responsible for organising an attack. Orders would have been given that nothing be touched. The priests may themselves may have gone in and taken and destroyed Christian objects, forbidding anyone else from touching anything in the fear that a cross may be found that they had missed. Such priestly commands would be even more unbreakable that a fear of disease. Other explanations about the Romanised "Sweden's Pompeii"
The Roman "amber commerce" was done mainly with a route that from ancient Roman Pannonia (actual western Hungary) reached the Baltic sea in the area of Koenisburg (actual Kaliningrad). The Swedish island of Öland is located just in front of this Prussian region and so could have been used by these Roman merchants as a trading outpost located a few miles from ancient Sweden. Romans used to have for their commerce small outpost in islands facing some distant regions. This was the case of Ireland: in places like Drumanagh (interpreted by some historians to be the site of a possible Roman fort or temporary camp) and Lambay island, some Roman military-related finds may be evidence for some form of Roman presence. The most commonly advanced interpretation is that any military presence was to provide security for traders, possibly in the form of an annual market where Romano-British and Irish met to trade; other interpretations, however, suggest these may be distant Roman trading outposts. Of course, the Ireland's Drumanagh/Lambay was an outpost that existed from the first to the third century AD during the 'hey day' of the Roman empire, while the possible Öland outpost was in existence in the fourth century. But the outpost could have been initially very little in the first or second century (and still to be fully discovered in future under the ruins of the Borg area). Further archaeological research will help in this matter. Finally I want to remember that there it is also a remote (but real, IMHO) possibility that the Öland island settlement was linked to the Danish "Roman Client State" that seems to have existed even in the island of Bornholm. Indeed in 2014 Ulla Lund Hansen has written that has been discovered a nice bronze brooch in the Danish island of Bornholm, located in the middle of the Baltic sea and not far from the Poland & Sweden coast. 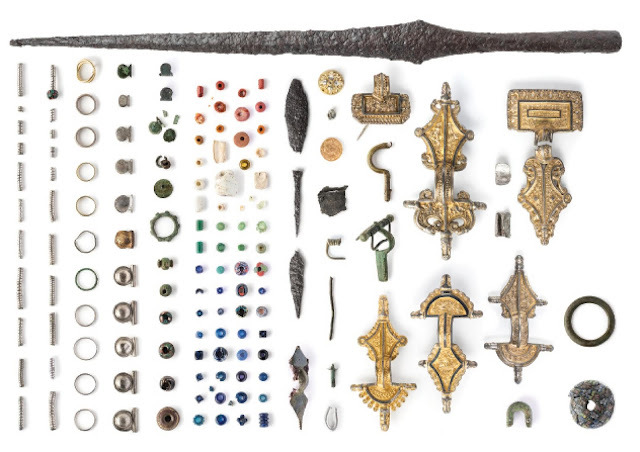 It was found at the ancient village of "Lavegaard", during the excavation of a Roman settlement on the island of Bornholm, located nearly one hundred miles south of Öland island. She wrote that "Larger excavation is underway, revealing an AFFLUENT ROMAN SOCIETY"...and the archaeologists hope to uncover many well-preserved remnants of this ancient community called Lavegaard. Besides the owl brooch, the archaeologists have found pottery and ancient building materials, postholes marking the sites of ancient houses, along with architectural features such as ovens and hearths (and a cemetery). All evidence of industry in the form of iron smelting or iron extraction and ceramics firing, and several well-preserved metal objects are also preserved...The excavated area now totals more than 5000 m² and so is part of a much larger settlement, which in Roman times would have had direct access to the sea via an inlet, now a wetland located just south of the settlement.In fact, all the evidence suggests that Lavegaard was a rather affluent society in its day. With easy access to the sea and evidence of industry and coins (dating to AD 161-175) at the site, the inhabitants of Lavegaard could presumably afford to buy and produce valuable jewelry and other objects(read more at "sciencenordic.com/ancient-roman-artifact-found-danish-island" ). And some valuable Roman jewelry/objects have been found in the borgs of Öland island (see above image). But I have to admit that this explanation seems to be based on a very weak possibility.